Scrum is a framework within which people can address complex adaptive problems, while productively and creatively delivering products of the highest possible value. Scrum is lightweight, simple to understand, difficult to master. Scrum is not a process or a technique for building products; rather, it is a framework within which we can employ various processes and techniques. Scrum makes clear the relative efficacy of our product management and development practices so that we can improve. If an inspector determines that one or more aspects of a process deviate outside acceptable limits, and that the resulting product will be unacceptable, the process being processed must be adjusted. An adjustment must be made as soon as possible to minimize further deviation. Scrum prescribes four formal events for inspection and adaptation: Sprint Planning, Daily Scrum, Sprint Review, and Sprint Retrospective. Openness. As we work together, we practice expressing how we’re doing, and what’s in our way. We learn that it is good to express concerns, so that they can be addressed. 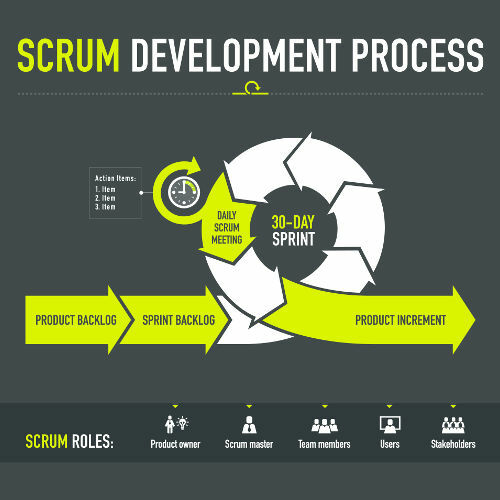 Scrum emphasizes creative and adaptive teamwork in solving complex problems; Lean development focuses on the continual elimination of waste; Kanban concentrates on reducing lead times and the amount of work in process (lead time = the total time the client is waiting for an item to be delivered). In Race we apply the Scrum framework together with the CCPM framework when we are developing the HOW and the WHEN.